Amsterdam, May 9th, 2018 - 24i Media, the leading internet TV app technology provider for the world’s top media companies, today announces the acquisition of Mautilus, the Czech TV app agency specializing in HbbTV and applications for multiple devices. The acquisition strengthens 24i’s technology framework with new products and features, and increases its production capacity with Mautilus’ highly-skilled engineers. 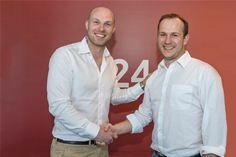 The acquisition of Mautilus is the next step in 24i’s ambition to deliver the most innovative, modular, flexible and scalable video streaming application technology. 24i continues to grow and expand its position in today’s evolving video landscape. While 2017 was a year of record growth, this trend is continuing into 2018. In fact, Mautilus is 24i’s second acquisition in 2018; the company acquired multiscreen video platform provider Vigour in March. “Innovation, agility and the ability to scale are crucial ingredients to surf the impressive waves caused by the TV industry’s fundamental changes. We’ve been able to accelerate our growth by picking partners that strengthen our strategic positioning. We always strive to attract great media professionals, whether individually or by teaming up with highly valued peers like Mautilus. Based on our successful integration with the former Siemens CVC front-end team in 2016, we are convinced of the value creation and cross-pollination of our teams in Brno,” added 24i’s Co-Founder and Chief Strategy Officer Hans Disch. Mautilus develops TV apps for multiple platforms, including smart TVs, mobile, HbbTV, as well as for games consoles, set-top-boxes, and much more. Its customers include HBO, T-Mobile, iFlix and Showmax. Having experienced rapid growth in 2018, as well as announcing the launch of the Tennis Channel app for Sinclair Broadcasting Group last month, 24i will continue to expand its market position in the coming months. 24i Media is an industry-leading global TV app developer with an award-winning technology framework, that supports clients to develop and deploy apps faster and more efficiently on all devices, screens and TV platforms. 24i empower broadcasters, content owners and operators with future-proof and flexible tools to create and monetize personalized TV apps, while accelerating time-to-market and reducing cost. 24i’s technology framework powers the digital experience for leading brands around the world, including RTL, Fox Sports, Sinclair Broadcasting Group, Globo, RTÉ, NPO, Fuse Media and many more. 24i Media, founded in 2009, is headquartered in Amsterdam, with offices in Los Angeles, New York, Buenos Aires, Madrid, Copenhagen and Brno. Mautilus was founded in 2010 and thanks to its rapid growth, it is currently ranked as number one in the smartphone apps market not only in the Czech Republic, but also across Central and Eastern Europe, Middle East and Asia. This Brno-based company is the only one in the Czech Republic which develops apps for all kinds of smart devices: mobile phones, tablets, smart TVs, HbbTV, game consoles, set-top boxes, and wearables. Mautilus offers worldwide software solutions for companies such as HBO, iflix, Showmax, O2, CME and Siemens. In cooperation with Internet Info, it organizes annual TVCON conference focused on TV technologies interconnected with the Internet (www.tvcon.tv).